For some Americans, summertime means visiting the beaches or national parks. For others, it means attending baseball games. And for many, it means cooking, eating, and generally enjoying American barbecue. Barbecue, or BBQ for short, is a style of cooking meat at a low temperature for a long time. But, not all American barbecue is the same. 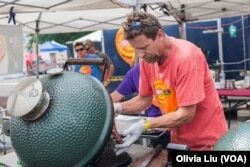 Mike Sargent recently drove almost 2,500 kilometers from Texas to Washington, D.C., to compete in the National Capital Barbecue Battle. 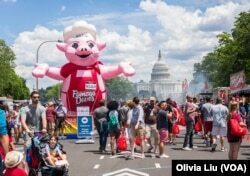 A blown up pig welcomes visitors to the National Capital Barbecue Battle in Washington D.C. on Sunday, June 25, 2017. The area stretches from Texas to the East Coast. Many people divide it into four main styles of American barbecue: Carolina-style, Memphis-style, Kansas City-style and Texas-style. Each is named after the state or city where the style was formed. But American barbecue is not actually that straightforward. Robert F. Moss is a barbecue expert and historian. He wrote the book Barbecue: The History of an American Institution. Moss says American barbecue is much more than just the four main styles. He says many areas within the Barbecue Belt have their own styles and flavors. The state of Alabama, for example, has its own special white-colored barbecue sauce. And California, a state far from the Barbecue Belt, has its own barbecue style called Santa Maria. Chris Capell inspects pork ribs that had been cooking on the grill at the National Capital Barbecue Battle in Washington D.C. on Sunday, June 25, 2017. Capell is the pitmaster for Dizzy Pig, a barbecue company in Virginia. Even Moss, the barbecue historian, says South Carolina’s style of barbecue is still special to him. He grew up in Greenville, in the western part of the state. Moss says American barbecue developed from several cultures in the Caribbean. Early European explorers observed Taino Indians in the Caribbean cooking whole animals over fire and smoke. They called it “barabicu,” or “sacred pit” in the Taino language. Spanish explorers called this cooking method “barbacoa.” As they traveled north, they spread barbacoa into the present-day southern American states, like Virginia, North Carolina and South Carolina. In the 1920s, the restaurant industry grew quickly in the United States. It was this rise in restaurants, Moss says, that helped lead to the creation of regional barbecue styles. Carolina-style barbecue is named after the states of North Carolina and South Carolina. Carolina barbecue today is the closest to the early, colonial-style of barbecue of the 1700s, Moss says. All across the Carolinas, pork is the main barbecue meat. They cook the whole hog over a pit. The pork meat is then shredded or chopped or “pulled.” Pulled pork is meat that is tender - or soft - enough to be pulled from the bone with little effort. From the Carolinas, barbecue traditions moved west, all the way to Texas. While Carolina-style barbecue is all about pork, Texas-style barbecue is all about beef. Texas is especially known for its smoked brisket. Brisket is a cut of meat from the lower chest of a cow, as pitmaster Mike Sargent explains. Texas-style barbecue is often cooked over pecan wood. Pecan trees are found across much of Texas. The city of Memphis, Tennessee, is home to another well-known style of American barbecue. Memphis-style BBQ may be best known for its pork ribs. The ribs can be served dry, without sauce, or wet, with sauce. Memphis-style sauce is sometimes very sweet, thanks to molasses – a thick, dark syrup made from raw sugar. Because the city sits along the Mississippi River, it was easy for locals to get molasses from steamboats that regularly carried goods up and down the river. Memphis-style barbecue led to the creation of Kansas City-style barbecue, because of one man, Henry Perry. The Memphis local worked as a steamboat cook. In the early 1900s, he moved north to Kansas City. Perry soon began cooking and serving barbecue for people in his new city. He went on to build a very successful Kansas City barbecue business. Kansas City is where Carolina and Memphis pork barbecue meet Texas beef barbecue. It is, as some food experts say, the best of both worlds. While it is best known for its pork ribs, Kansas City also does beef brisket. It is known for its thick, tomato-based sauce that is both sweet and spicy. Barbecue has become serious business in Kansas City. It holds the so-called “World Series” of barbecue every year. The huge contest is called the American Royal. But barbecue is not about the competition. It is about eating. If cooked right, barbecued meat falls off the bone. You do not need to use a fork or knife to eat it. Usually, you can eat with your hands. Rebecca Sansale is from Pennsylvania. 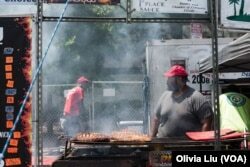 At the National Capital Barbecue Battle in Washington, D.C., she said barbecue is one of her favorite kinds of food. A traditional American barbecue usually includes side dishes like potato salad, cole slaw, baked beans or macaroni and cheese. Chuck Smith is a cook at Smoke Shack, a barbecue restaurant in Columbus, Ohio. An employee of Smoke Shack waits for ribs to cook on Sunday, June 25, 2017 at the National Capital Barbecue Battle in Washington D.C.
“Off the hook” means really, really good. In summer months, people in the United States often invite friends and family members over for a barbecue. They cook meat outside on a grill and prepare side dishes similar to Chuck Smith’s. Pitmasters like Sargent and Robbins did not learn their trade at cooking schools. Instead, they learned through family barbecues in their own backyards. Sargent says, in Texas, everybody has a grill in the backyard. Do you have a special kind of barbecue in your country or city? Tell us about it in the comments section. Ashley Thompson and Olivia Liu reported and wrote this story. Hai Do was the editor. Dorothy Gundy produced the video. chop ​ ​- v.​ to cut (something) into pieces by hitting it with the sharp edge of an ax, knife, etc.